Arnold E Hayes was a Boy Soldier with the 1st Battalion at the outbreak of the Second World War, based in Karachi, India. 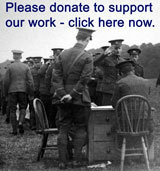 He and his son donated photographs between 1998 and 2006. 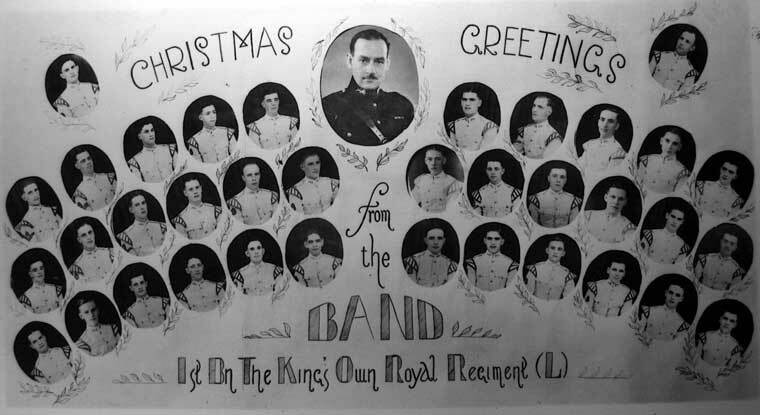 Christmas Card featuring the members of the 1st Battalion's Band based at Napier Barracks, Karachi, India, either 1940 or 1941. Bandmaster, pictured centre is A Coventry. The bandsmen are: W Eyre and F E Johncocks, pictured top left and right. Rear row, left to right, H Wilkes, W Quarrill, G E Hollyhock, H G Bray, H Johnston, G Edwards, R A Johncocks, unknown, J Grange, and W Fernley. Centre row, H A Swann, G Carkeet, N Williams, M Collings, T C Wilshaw, J Nash, unknown, S Harrison, E Bancroft, R Feltham, M Wood, and J W Herbert. Front row, J Lowe, G Turner, J Patton, N Wooldridge, J Kempster, V Austin, W Steel, H Fairweather, J P Crowley, A Taylor, J Gibson and T Waites. Private Walter Fleming and his dog 'Bess' at Napier Barracks, Karachi. 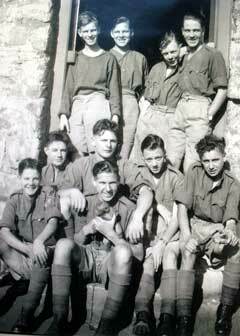 Boy soldiers of the 1st Battalion, whilst at Hastings Barracks, Wellington, Nilgiri Hills, Southern India, September 1939. 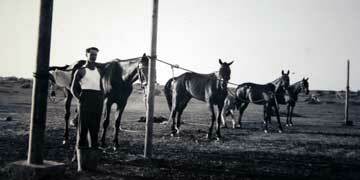 Front row, left to right, Boys Murphy and Pearson (with pet monkey). Back row, left to right, Boys Machin, Wassiner, Martin and John Grange. Standing, left to right, Boys Turner, Roy Feltham, Albert Anderton and Arnold E Hayes. 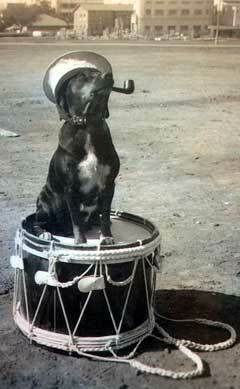 Band and Drums of the 1st Battalion, at Napier Barracks, Karachi, India, 1940. Drum Major Williams and Bandmaster A Coventry. 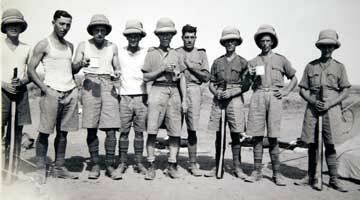 Some of the 1st Battalion whilst out training in the Sind Desert near Karachi, 1940. 'x' marks Corporal Adams. 'Digging in' construction of defences in the Sind Desert. 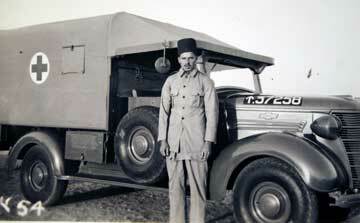 One of the civilian ambulance drivers of the 1st Battalion, Karachi, 1940. 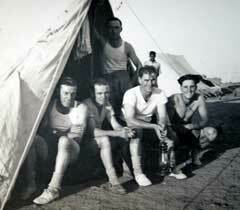 Training Camp in the Sind Desert, 1st Battalion, 1940. 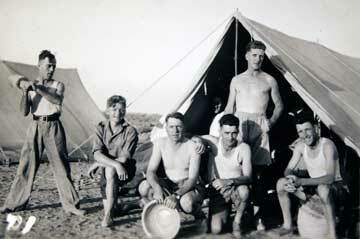 Field Kitchen, training camp, Sind Desert, 1st Battalion, 1940. 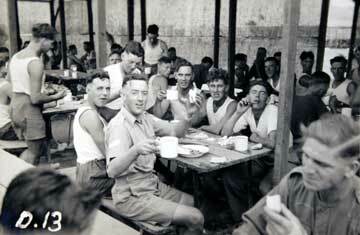 Meal time at the field kitchen, Sind Desert, 1st Battalion, 1940. 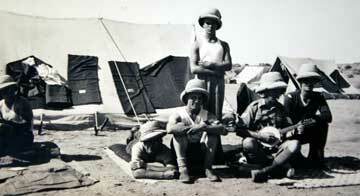 Troops training in the Sind Desert, 1st Battalion, 1940. 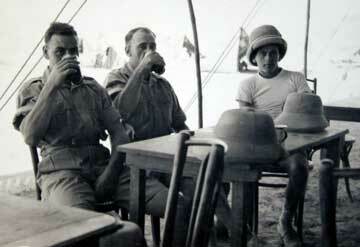 Wet Canteen at Training Camp in the Sind Desert, 1940. 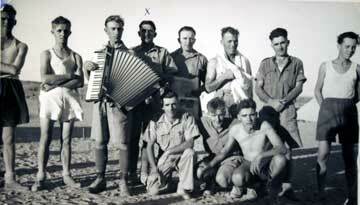 Sergeant Cunningham marked with 'x' and others of the 1st Battalion, Sind Desert Training Camp, 1940. 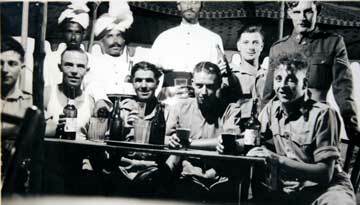 Six of the Indian civilian cooks with five of the 1st Battalion's cooks, Sind Desert Training Camp, 1940. 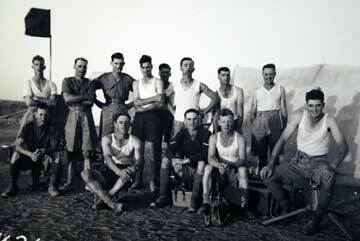 Support Platoon of 1st Battalion, Sind Desert Training Camp, 1940. Quarter Guard, 1st Battalion, Sind Desert Training Camp, 1940. Marching troops, 1st Battalion, Sind Desert Training Camp, 'x' marks Private Arnold E Hayes. 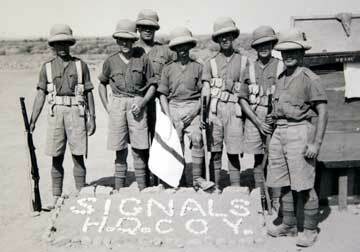 Signals Section of Headquarter Company, 1st Battalion, Sind Desert Training Camp, 1940. 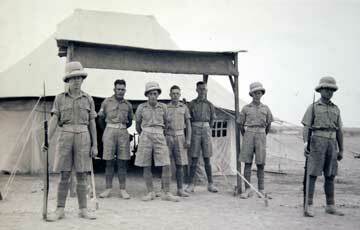 Guard mounting at the Sind Desert Training Camp, 1940. 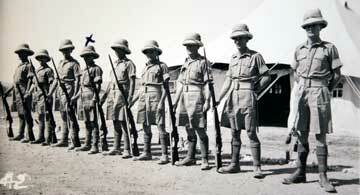 Soldiers on parade at the Sind Desert Training Camp, 1940. 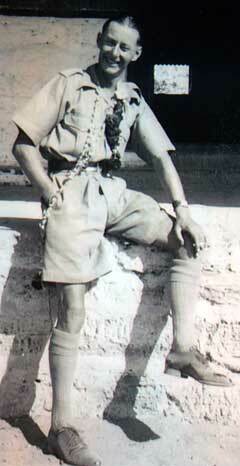 Quarter Guard at the Sind Desert Training Camp, 1940. 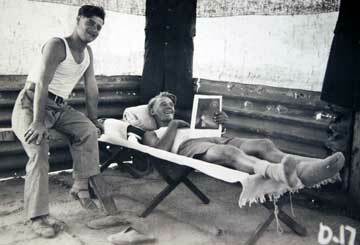 'x' marks Private Arnold E Hayes. 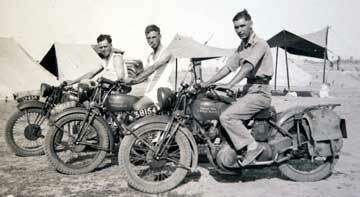 The motorcycles of signal platoon. 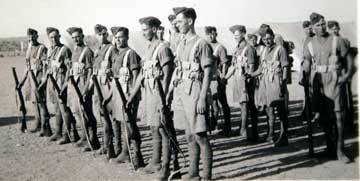 1st Battalion, India circa 1940. 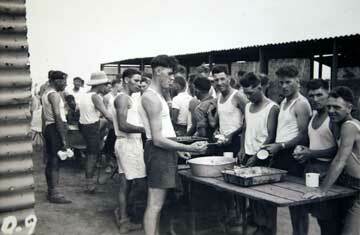 Serving food at the Training Camp in the Sind Desert, 1940. 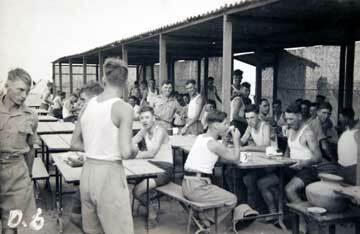 Cookhouse interior, Training Camp in the Sind Desert, 1940. 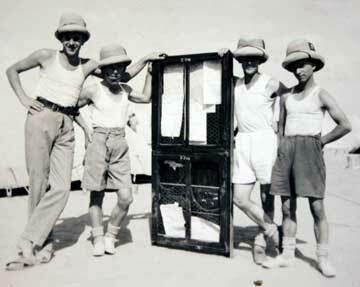 Soldiers at 'C' Company notice board, Training Camp in the Sind Desert, 1940. 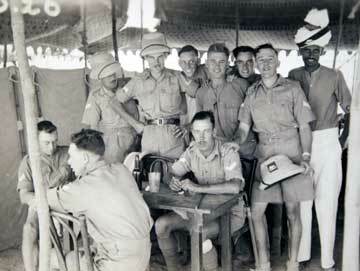 Group of Corporals of the 1st Battalion, India, 1940. 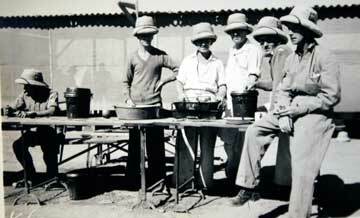 Cookhouse at meal time, 1st Battalion, Sind Desert Training Camp, 1940. 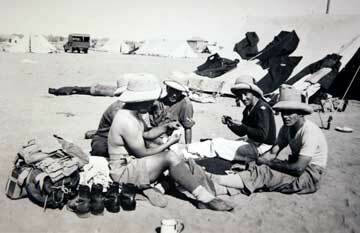 Wet canteen, 1st Battalion, Sind Desert Training Camp, 1940. 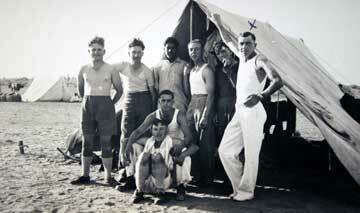 Group of soldiers of 1st Battalion, Sind Desert Training Camp, 1940. 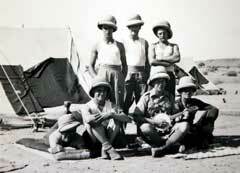 Group of soldiers of the 1st Battalion, Sind Desert Training Camp, 1940. 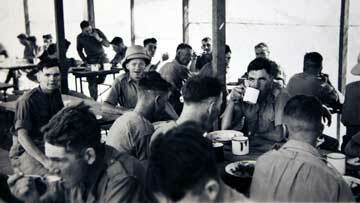 Soldiers in Cookhouse, 1st Battalion, Sind Desert Training Camp,1940. 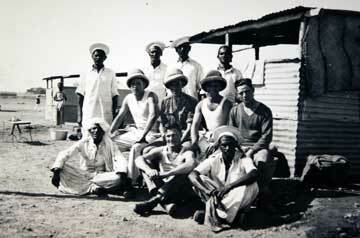 Soldiers accommodation, Sind Desert Training Camp, 1940. 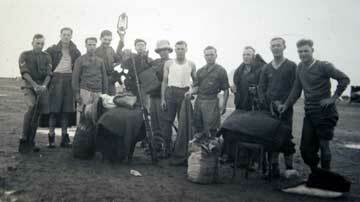 Animal transport of 1st Battalion, Sind Desert Training Camp, 1940. 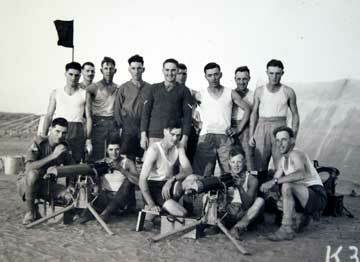 Soldiers of the 1st Battalion at the Sind Desert Training Camp, 1940. 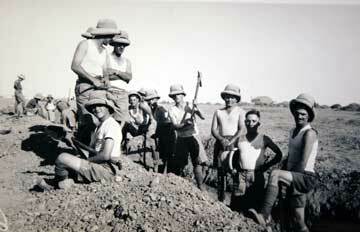 Soldiers of the 1st Battalion at the Sind Desert Training Camp, 1940, probably digging the latrines. 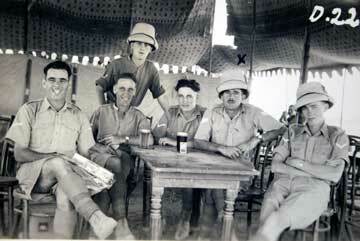 Group of soldiers of the 1st Battalion at the Sind Desert Training Camp, 1940. Sind Desert Training Camp, India, 1940. 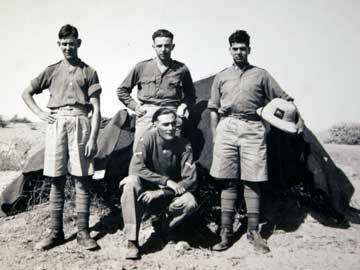 4 soldiers of the 1st Battalion, Sind Desert Training Camp, 1940. 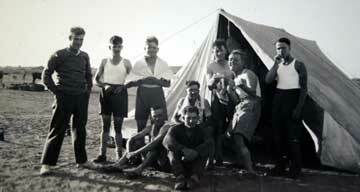 Members of the 1st Battalion, Sind Desert Training Camp, 1940. Soldiers of the 1st Battalion, Sind Desert Training Camp, 1940. Three soldiers, 1st Battalion, Sind Desert Training Camp, 1940. 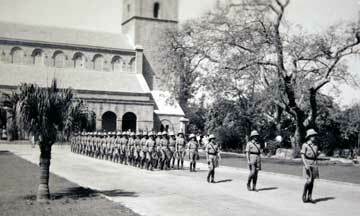 Soldiers of the 1st Battalion marching back from the Anglican Church, Karachi, India, 1940. 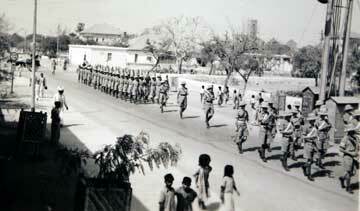 Soldiers of the 1st Battalion marching through Karachi, India, 1940.